The latest chemical damp proof course technology has been launched by Twistfix. Damp-Cure is the most advanced DPC injection cream available. The injection cream has been formulated exclusively for Twistfix under the manufacturers BBA Approval. DampCure is clean, safe and easy to use and requires no specialist equipment when damp proofing walls. 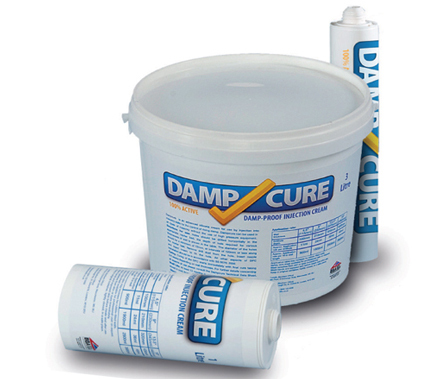 Damp Cure injection cream is formulated as a 100% active rising damp treatment that migrates fully into walls. It is available is 380ml cartridges, 1 litre tubes and 3 litre containers. Twistfix also supplies these products in a series of low cost damp proofing kits at prices to suit your budget. DampCure DPC cream is designed for insertion into any wall having a mortar bed joint that that is continuous along and through the wall. The cream migrates through the pore structure of the wall allowing silanes and siloxines to form a durable chemical damp proof course. Twistfix is the UK's exclusive supplier of DampCure damp proofing cream products. For more information regarding this or for any other questions and queries then contact us on 0845 1236007 or email info@twistfix.co.uk.